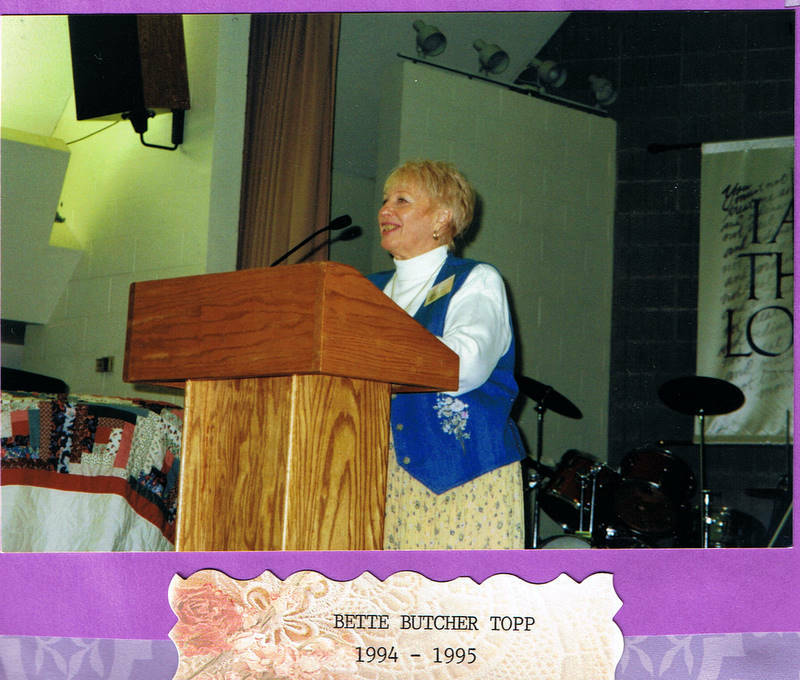 Bette Butcher Topp was EWGS President for four years 1994 and 1995, and again 2004 and 2005. So far she is the only person to be EWGS President for four years. Bette was born in Honolulu, Hawaii to Hobart Sampson Butcher (9 Jul 1898-14 Apr 1989) b. Spencer, Roane County, West Virginia. He married 23 August 1931 in San Diego, California, Gladys Vernen Moree b. 10 July 1907 at Plevna, Reno County, Kansas d. 24 July 1981 in Spokane, Washington. In 1952 in Yuma, Arizona Bette married John Andrew Topp, and if you read on Bette's website you will learn that he is a descendant of John Johan Topp from Estonia. Bette also was researching during the time of surname quarterlies, and she was the author of Butcher Block, Carpenter Chronicles, Bush Branches and VA/WVA Queries. Bette was also EWGS President in 1994 when the new Spokane Public Library Downtown branch opened, and we were so thankful that the genealogy section was on the third floor of the new library building. During the construction the library was in the old J.C. Penny's building and the genealogy section was just inside the east door, and a lot of "homeless" people would come in and promptly go to sleep in the gene section. While the library was under construction we met at the MAC, and the first meeting of 1994 was still at the MAC. The 1994 fall workshop was at Mukogowa Fort Wright with Marvelene Carney as chair. Spring seminar 1995 was April 22, 1995 and featured Arlene Eakle. June 3, 1995 EWGS had the 60th Anniversary celebration. September 20-23, 1995 FGS/SGS Conference at Seattle, From Sea to Shining Sea. The October workshop was October 7, 1995 and featured George Ott and Wade Hone on Military Records. It was at Mukogowa Fort Wright and cost $22.00. In the December 1995 Bulletin was a Cousins Corner featuring the common ancestor George Schwab b.c1610 Wurttenburg, Germany. The Four Cousins were Bette Butcher Topp, Charles Michael Hansen, Linda Wilke, and Leslie Wood. Up to then I did not know I had any German ancestors and then I find I am a cousin to Bette. Bette became EWGS President again in 2004 and June 5, 2004 EWGS hosted Sabine Schleichert on German Research. The October workshop was October 7, 2004 and we had Leslie Smith Collier at Country Homes Christian Church, cost $18.00. Everyone liked her so much EWGS had her back for the spring seminar April 23, 2005. She talked on researching in Campbell County Tennessee and I had several families there, so I was really interested in her talks. The October workshop was at the Corbin Community Center October 1, 2005 and cost $10.00 but bring your own lunch. Bette Topp is one of the hardest working members of EWGS and really deserved her becoming a Distinguished Service Member in 1996. She has been EWGS President more than any other person, and held chairmanships for many committees, and conferences, including WSGS conferences. She was even the Bulletin Editor once, and today holds two positions Library Liaison, and EWGS Emeritus. She also chaired the 75th Anniversary Celebration for EWGS, see the story here. Just have to share: June, 2010, Cecily Kelly and I are in Annapolis, MD, for to drive her daughter's two doxie dogs home (Spokane to Annapolis) and to then do some reseach in Tennessee. It was here in Annapolis that a Really Exciting Research Story happened. Browsing in an antique shop in Annapolis (remember: home of the U.S. Naval Academy) we found a wrist purse from the class of 1920. (A gift was given to a man's intended at the annual traditional Ring Dance.) Inside this little 3x4 inch silver compact were pictures of a Naval officer. On the back was one word: Hamlin. Thank goodness! Arthur Leroy Hamlin in the class of 1922 (why the difference? don't know). Finding a few more facts about Arthur (his Naval career and his death/burial in California) we were off and running. Within hours that evening, Cecily (using Ancestry mostly)learned some details of Capt. Hamlin's career in the Pacific. He was stationed Seattle; he married Emma who'd been born there and was of Norwegian descent. Off they went to Guam where son David Richard was born. This son went on to attend the Academy, class of 1948. Using the Internet, Cecily was able to contact the secretary of the Class of 1948's alumni association and we learned that David Richard was still alive and had descendats!